Various studies have suggested that the air inside our homes could be more polluted than outdoors. Today, we explain what to check when buying air purifiers. Families have been reacting to this discomforting truth in different ways, including by investing in the best air purifier they can find. However, it hasn’t been that smooth sailing with a lot of misinformation being peddled around. So, assuming you’ve decided to take the battle to the contaminants using an air purifier, what should you look out for? Here’s a brief guide to assist you to land the very best air purifier. Most first-timers think that air purifiers of any size will serve their rooms. This can’t be further from the truth. Always verify the square footage ratings of your target device vis-à-vis the size of your room. HEPA (High-Efficiency Particulate Arrestance) certified air purifiers are known to be very effective in capturing even the tiniest micro-organisms. Some units show the CADR – a measure of the amount of air passing through the unit. It tells you how efficiently will your unit work. For example, a CADR rating of about 200 would purify around 300 sq. ft. optimally, but slow down in bigger spaces. A better solution would be to upgrade to HEPA systems. Depending on your usage, you may need to replace its carbon filters after every 3 months, while the filter barely goes beyond one year in any case. Luckily, you can opt for energy-efficient models (Energy Star Qualified) and those with reusable filters. An ionizer pulls particles using a static electricity-like mechanism and can be very useful. However, ensure it doesn’t produce ozone (some do), as it can irritate your lungs. You surely don’t want an air purifier that forces you to spend on a technician because you’re unable to install. Also, know that portable purifiers serve one room at a time but can be moved around so they have a bit of an advantage. 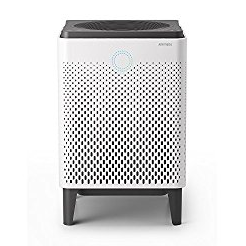 To get the best air purifier, check on features like ease of mounting, running cost, size, and technicalities like HEPA certification. Another thing to consider is using the best vacuum for pet hair to complement your efforts.